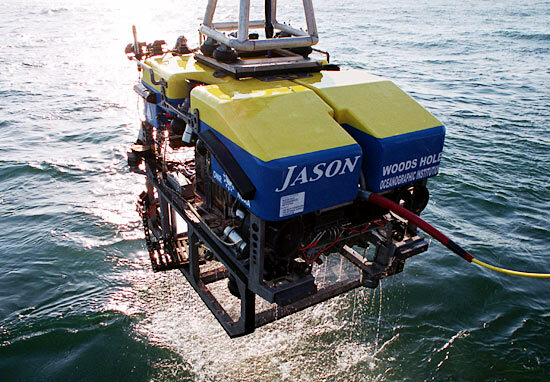 Jason is a remotely operated vehicle (ROV) designed and built by WHOI’s Deep Submergence Laboratory to allow scientists to have access to the seafloor without leaving the deck of a ship. Jason is a two-body ROV system. A 10-kilometer (6-mile) fiber-optic tether delivers electrical power and commands from the ship through Medea and down to Jason, which then returns data and live video imagery. Medea serves as a shock absorber, buffering Jason from the movements of the ship, while providing lighting and a bird’s eye view of the ROV during seafloor operations. Jason is equipped with sonar imagers, water samplers, video and still cameras, and lighting gear. Jason’s manipulator arms collect samples of rock, sediment, or marine life and place them in the vehicle’s basket or on “elevator” platforms that float heavier loads to the surface. Pilots and scientists work from a control room on the ship to monitor Jason’s instruments and video while maneuvering the vehicle. 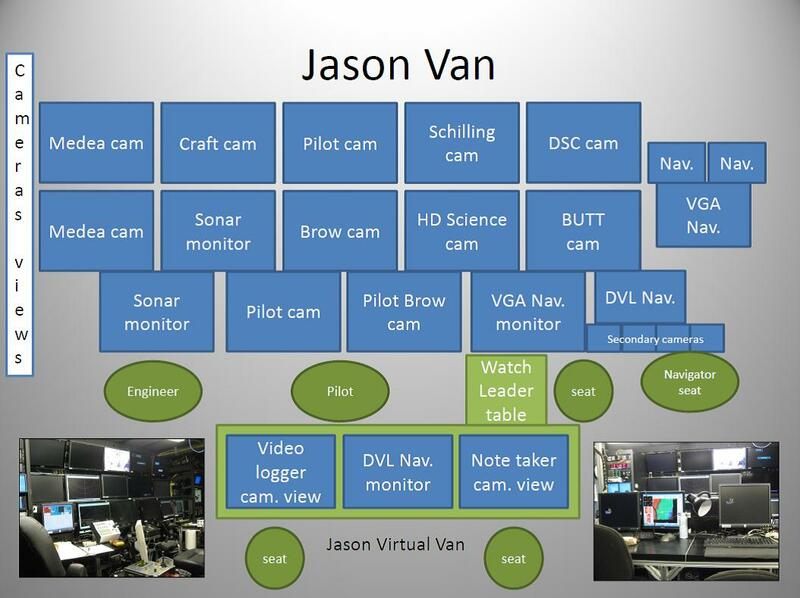 The figures and schematic show the present configuration of the control van that the Jason group and scientists are using to do their research tasks for the current cruise. The average Jason dive lasts 21 hours, though operators have kept the vehicle down for as long as 100 hours. For this cruise, the vehicle will be down from 24 to 36 hours per dive. Jason was first launched in 1988, and the system has been used for hundreds of dives to hydrothermal vents in the Pacific, Atlantic, and Indian Oceans. ROV Jason is now in its second generation, with a sturdier, more advanced vehicle having been launched in 2002.
archeology. A prototype version named Jason Jr. was used to survey the wreck of RMS Titanic, and the fully developed Jason visited a 1,600-year-old Roman trading ship in 1989. Jason and Medea are named for the adventurous ocean explorer of Greek mythology and for his wife. Read about Jason’s front basket.